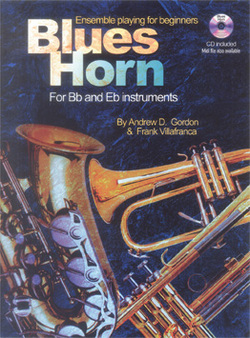 Blues Horn Ensemble Playing presents the material in a way in which beginning and intermediate horn players can gain an understanding of blues ensemble playing quickly and easily. The twenty examples recorded on the CD provide a dual purpose. They take you through a variety of musical styles including, swing blues, slow blues, funky blues, jazz blues, latin blues, minor blues, mostly based on the standard 12 bar blues chord progression and include four choruses each. The first two choruses are recorded with the horns and rhythm section consisting of keyboards, guitar, bass and drums and the last two choruses are rhythm section only. On the last two choruses you may want to play the riffs again or practice playing your own melodic blues solos. These examples will help you build a repertoire of riffs you can use in a live situation. Hopefully, they will also provide inspiration to help you come up with your own ideas.